Constance Howard, was 89 when she passed away some fifteen years ago. Like me, you may not have heard of her. 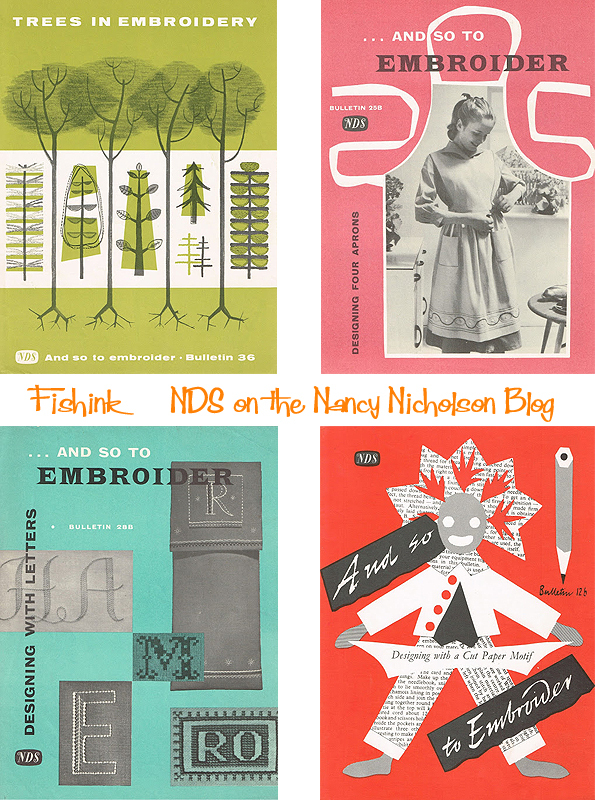 I have an old copy of her book, aptly called ‘Inspiration For Embroidery’ from 1966, which has been reprinted numerous times since. It’s crammed with tips, drawings, design motifs and of course embroideries over the 200+ pages. 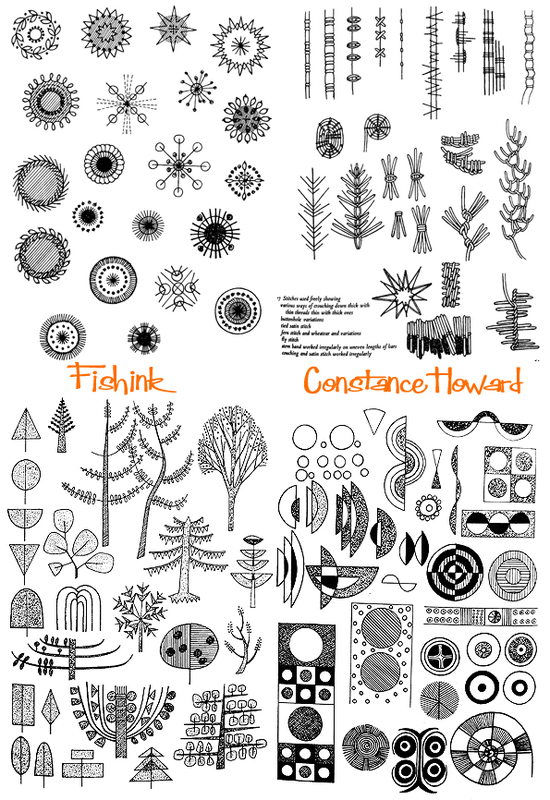 The Guardian described her as ‘A remarkable artist, an inspiring teacher and an extraordinary character and arguably the most influential British pioneer in textile design of her generation.’ My curiosity was ignited… I decided to dig a little deeper and discover more. 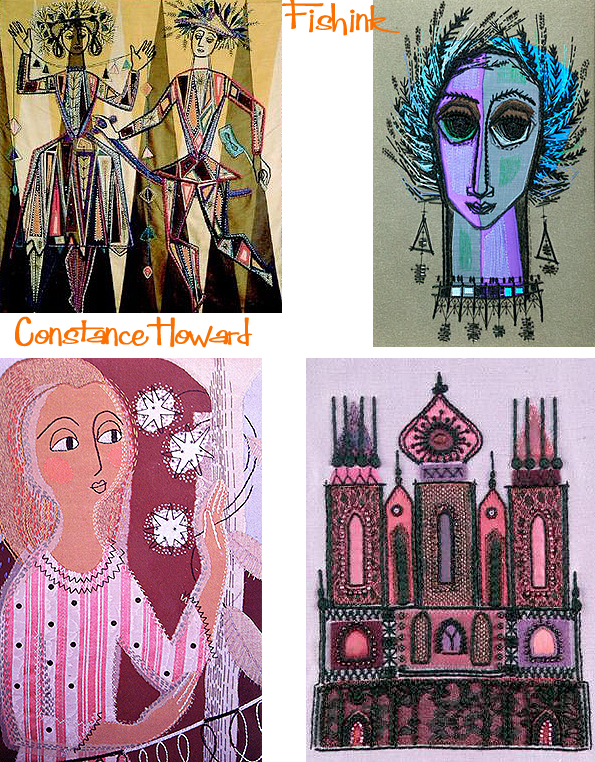 Born in Northampton, the daughter of an impecunious schoolmaster, from the age of 10 she studied art at evening class. After leaving school at 14, she was denied a grant to the Royal College of Art – on the grounds that the money would be wasted because she would end up getting married. The authorities were half right: in 1945 she married the sculptor Harold Wilson Parker. In 1947, she became a part-time tutor at Goldsmiths College in south-east London, at a time when it was struggling to find its feet again after the dislocations of the second world war. She went on to establish an embroidery department in the arts school, and to become principal lecturer in charge of textiles and fashion. 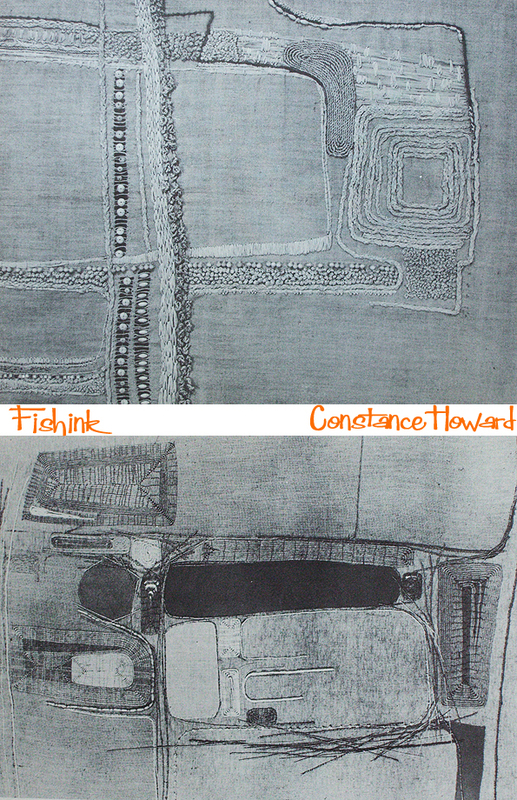 Textiles at Goldsmiths came to influence the field everywhere – partly because of Constance’s energetic proselytising and example, which nurtured the idea of embroidery as an art form and vehicle for artistic self-expression. As well as working in textiles, she did much to build the tradition at Goldsmiths that gave the college its leading role in art and design. Following her retirement in 1975, she was awarded the MBE for services to embroidery. Her standing continued to grow, partly on the basis of visiting lectures in Europe and the US, and her authorship of a number of key texts. At Goldsmiths the Constance Howard Textiles Special Collection was established, which now contains more than 2,000 textile pieces and related items, many of major historical importance. A small, slight figure, Constance remained a powerfully individualistic personality to the end of her life. Her enthusiasm for textiles communicated itself to everyone who knew her, while her kind and patient approach to teaching endeared her to generations of students. She was no shrinking violet. Long before the arrival of punks, she wore bright green hair. In the 1930s, she allegedly used lithographers’ ink as dye. Later, she switched to fluorescence: at a Goldsmiths lecture held in her honour, the head of the indomitable nonagenarian flashed like a traffic light, unmistakably, from the middle of the audience. 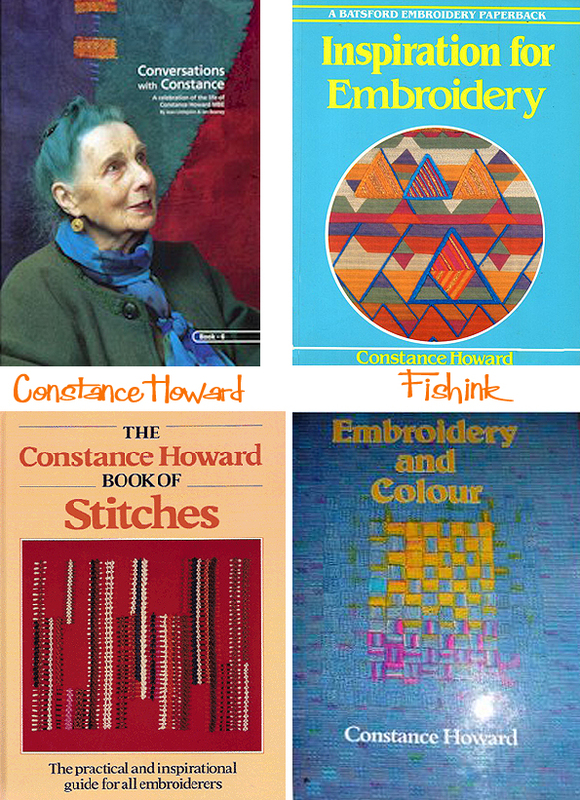 A prolific writer, her books included Design For Embroidery From Traditional English Sources (1956), Inspiration For Embroidery (1966) and Embroidery And Colour (1976). 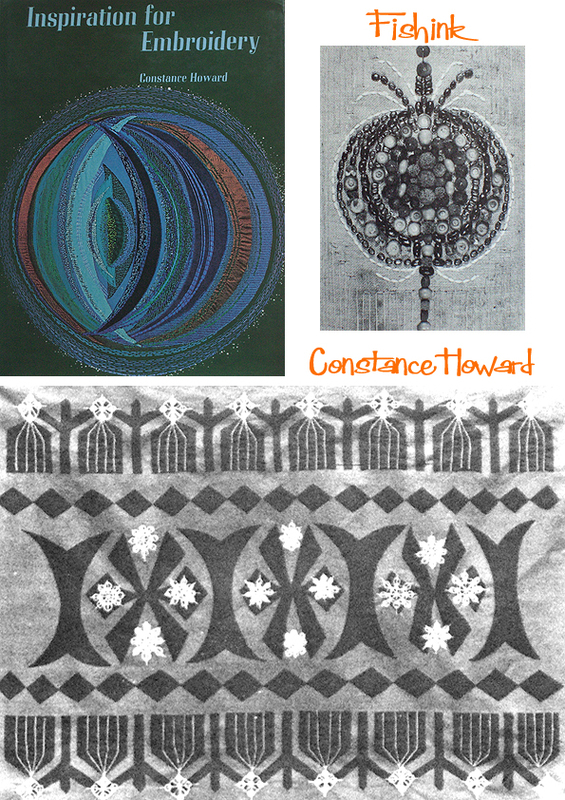 A year later she published Textile Crafts, in 1979 came The Constance Howard Book of Stitches, and during the next few years she researched and wrote a classic four-volume study, Twentieth Century Embroidery In Great Britain (1981-86). Many thanks to ‘The Guardian‘ for this information about Constance. 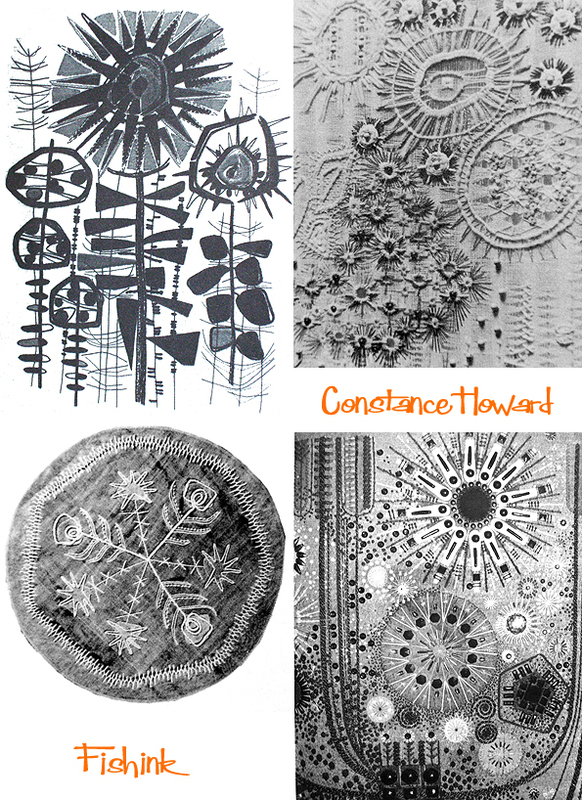 It’s important to bear in mind that when Constance began working, embroidery and textile design were seen by many people as comparatively minor crafts. That they have since become important artistic genres, is due a great deal, to her work and example. What an inspirational woman ! I thought you might like to see and share this. 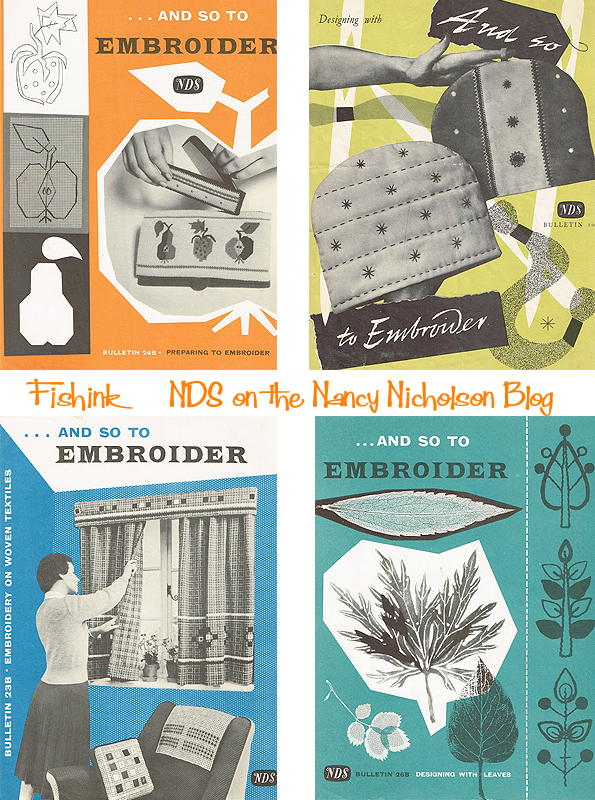 Continuing on a similar theme, I couldn’t help but want to share these amazing covers from 1950’s Needlework Development Scheme (NDS) I saw recently over on Nancy Nicholson’s Blog. I particularly like their colour palette. This ‘Trees in Embroidery’ one below really caught my eye. 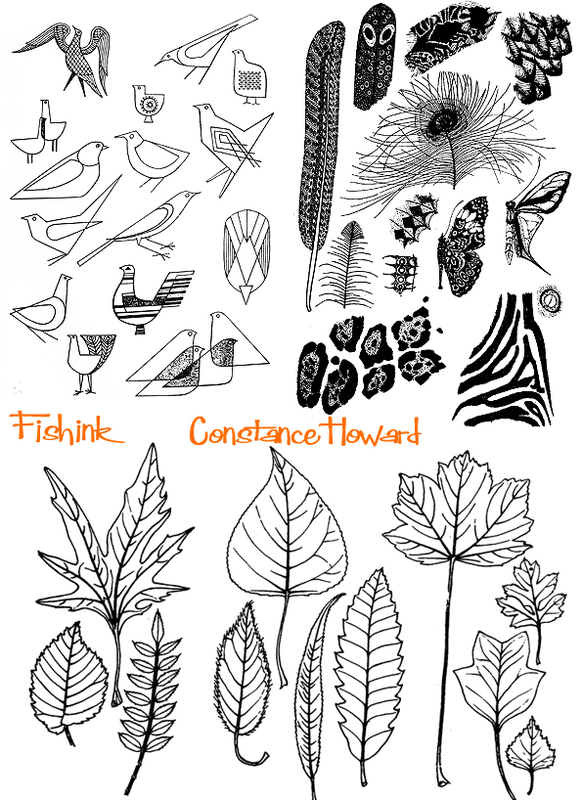 Thanks for sharing them Nancy and there’s more about Nancy’s own beautiful work on an earlier Fishink blog here. Enjoy. 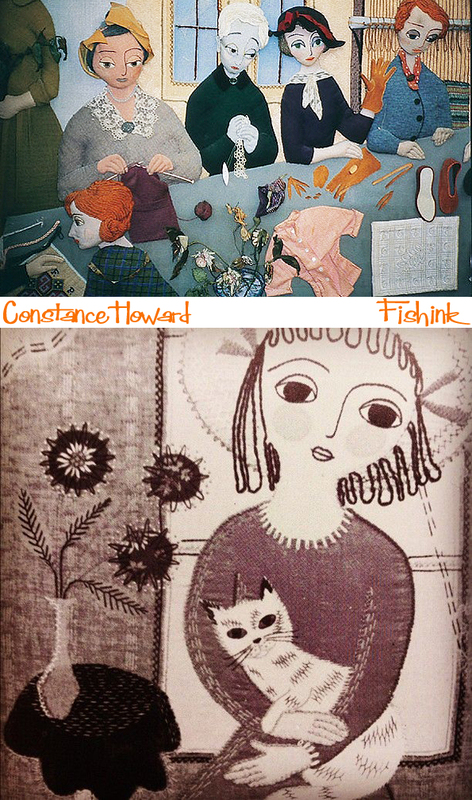 If anyone has any more of Constance’s books and would like to share some illustrations with Fishink Blog then please let me know. Embroidery is one of the first ‘crafts’ I learned, have enjoyed it for years. Nice post, I like how Constance didn’t allow a little thing like being refused a grant to the RCA stand in her way. Exactly Joy. It sounds like she was a determined lady who knew exactly where she wanted to be and what she wanted to achieve, and did both. When I was doing my City & Guilds Embroidery course at Windsor, Constance would visit our end of year show every year. Remarkable lady. 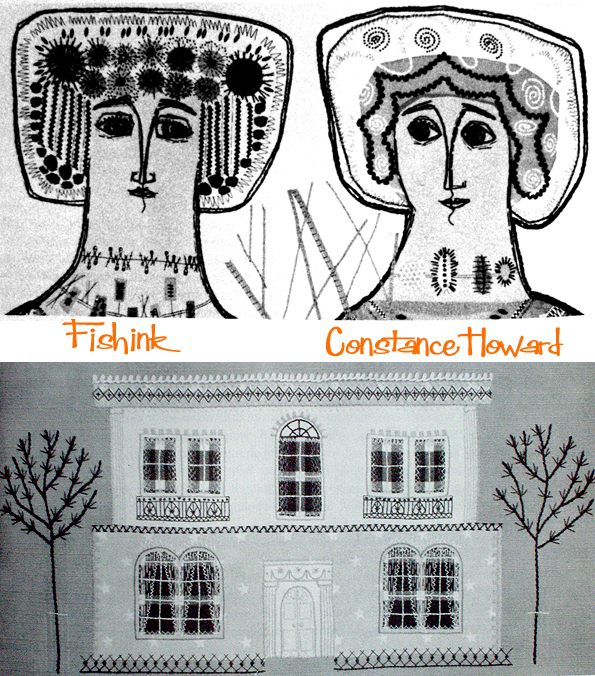 Your readers might like to know that you can view The Country Wife Mural at the National Needlework Archive in Newbury, Berkshire. 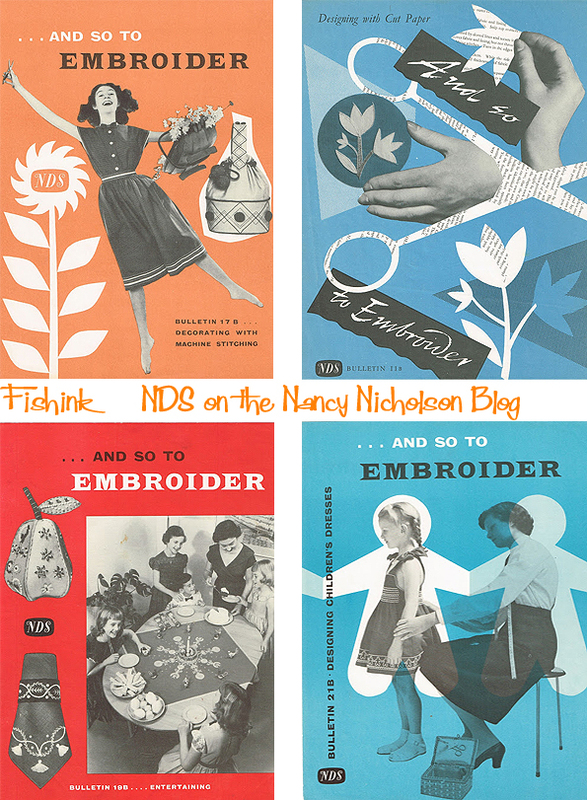 Check out their website for details http://www.nationalneedleworkarchive.org.uk/index.html. The Mural is an amazing piece of work and definitely worth visiting. Thanks for that link, just took a peak and I am floored at the size of her mural! It is fantastic! Would be wonderful to see it up close. I hadn’t realized it was 2 dimensional.